(…continued) Whether or not an evergreen tree ever grew on the spot where Boniface cut down the sacred Oak of Thor, the connection of the Christmas tree to that legend is a reminder that the birth of Jesus in that lonely stable led to a worldwide movement. The angels’ announcement to the shepherds on that first Christmas night was that a Savior was born, and that this was good news of a great joy to all people. That baby would grow up, and as a young man gather some disciples around himself. He would teach them for three years, and then send them to the ends of the earth with the Gospel message of salvation in Him. They would not get all around the world in that first generation, and some places, like the most remote areas of Germany, had to wait for seven centuries; and some are still waiting. The shepherds were the first to spread the good news, and from then on it was people like Boniface that carried out the work, often at the cost of their own lives. In spite of the uncertain origin of the tradition of the Christmas tree, it has come to symbolize many different things. There is often a star at the top, symbolizing the star in the story of the Magi. 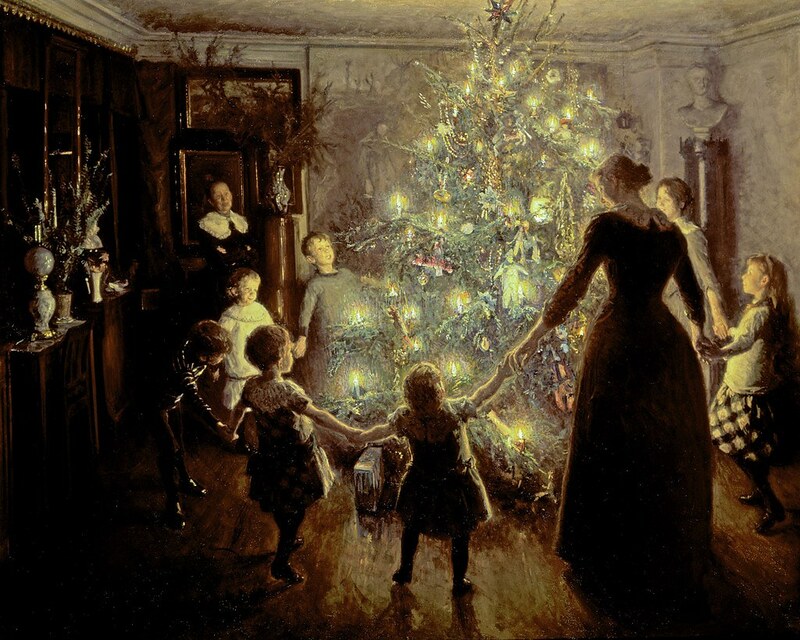 There are the lights on the tree– electric bulbs, or, candles in the old days, symbolizing Christ as the light of the world. And the ornaments, especially on church Christmas trees, have often been symbols of the Christian faith. There is one other symbolic use of the tree that is not as often remembered. This was from the days before artificial trees. Back then, in some churches the trunk of the Christmas tree was stripped of all its branches, and then that wood would be used to make the cross to be put in the front of the church during Lent the next year. This would serve as a reminder that this child in the wooden manger was born to suffer and to die, years later, on a wooden cross. This is what old Simeon declared when Mary and Joseph brought the baby Jesus into the temple for the first time a few days after his birth. “A sword will pierce your soul,” he said to the baby’s mother, and we who know the rest of the story can already picture her grieving at the foot of the cross. But Simeon also said that this child would mean the promise of salvation for all people. Although Mary’s heart would be pierced with grief by the sight of her son’s death on the cross, the empty cross would become the symbol of our eternal salvation. The use of a tree as a Christmas tree in a home always means the death of that tree, just as the birth of the Son of God as a human would mean that he would die a death like every other human being ever born. But then would come the most important part of the whole story, the main event of all history, which was when Jesus Christ would rise from the dead. The birth of Jesus at Christmas is just beginning of the greatest story ever told. It is the story of God who became a man, entered our lives, and then suffered and died; in order that we might be forgiven and live eternally with him, in his home. Luke 2:16-18 — So they hurried off and found Mary and Joseph, and the baby, who was lying in the manger. When they had seen him, they spread the word concerning what had been told them about this child, and all who heard it were amazed at what the shepherds said to them.